We recently released Low Tone’s ‘You’ll Be Lucky EP‘ with remixes by Howard Sessions and Phasen. Who is Low Tone we hear some of you ask? We catched up with Al Bradley and Carlo Gambino for a little chat to hopefully get a few answers. Guys, hope you’re both well. Thanks for taking time out to talk to us. You live in Leeds in the UK. Please tell us how you met and why you teamed up as ‘Low Tone’? Yes we both in Leeds and we have been best of friends for a decade. We met many moons ago in our hometown, then through the love of music began making music together. We have DJ’d a lot together so it was a natural progression to start producing together. ‘Low Tone’ was born in 2014 and here we are today! Your new ‘You’ll Be Lucky EP’ hit the stores recently. Please describe your own music and where you get your inspiration? Al – Well I think we both come from similar backgrounds in terms of absorbing well over a couple of decades worth of house music. I’d say Carlo perhaps is more ‘house’ & I lean a little bit ‘tech’, but that’s probably too simple really! It’s probably fair to just say we work well together as we’ve known each other a long time! Carlo - I produce and play totally across the board – but when it comes to producing with Al under our Low Tone Guise we kinda meet in the middle. I think our EP with you really shows that, it’s definitely a collaboration of minds. Please talk us through the work process. Who does what? Do you work separately or sit together in a studio and how do you make your music? Al – We’ve done a bit of each really, haven’t we? Some bits previously we’ve worked on percussion, grooves etc separately & then come together. However we do prefer to actually work in the same room, as we can be much more spontaneous & change things more quickly – as we’re both busy individually, we have to make the most of our time! Carlo – Yeah we do our separate bits then finalize the track together. But like Al said we much prefer to work together in the studio together which is what we do most of the time. Working this way makes us bounce off each other, it’s a great feeling sat together hearing you have just potentially come up with a winner. You both run your own successful labels. Why did you decide to join our What Happens label? Al – Well I knew about the label before via different artists on there, plus I’ve been aware of Tim for a good while too, so I knew it was a label which focused on quality, as opposed to just ‘big names’, which is much like my own 3am & I’m sure Carlo would say the same for Midnight Social. Carlo – First of all thanks for having us! I’ve obviously heard of the label and of course I’ve heard of Tim! We had a small number of quality labels we wanted to get in contact with and luckily for us you guys loved the EP. I know you’re both DJing here, there and everywhere. How do you see the current club scene in Leeds and the UK as a whole? Al – It’s just changed so much really; it’s very easy for people to say “it’s not like it used to be”, but frankly I wouldn’t want it to be like it used to be, as that would mean the scene had remained the same for almost 30 years! That would be so massively boring! Like all things, there are positives and negatives, but there is still so much good stuff, both here in Leeds and nationally too – I personally think the shift back to people going a little more DIY & underground is good. Carlo – Leeds has always been a great city for house music and will set to continue I’m sure for years. But it has certainly changed over the years. There are some really good changes happening in the city, especially the rise of a lot of young artists and labels. Gone are the days of huge events but the love of small underground intermit parties. Do you see yourself more as DJs, producers or label owners these days? Al – I think for me it’s DJ, label owner then producer, as that’s the order it happened for me & I guess DJing is the catalyst for everything else which followed. In the last 3 or 4 years though, my production side of things has really taken off, plus I’ve stripped the label back a little bit, so maybe the order for me should be DJ, producer, label owner, although the label is still such a big part of my life – 12 years now! 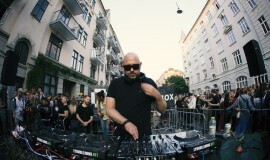 Carlo – Mine is nearly same as Al – I just started DJing then the production followed which then has obviously led onto running and owning my own label. I’m not quite in the same length league as Al as I’m only 4 years in but I’m not far off 40 releases already so I’m doing ok. DJing is what pays and all the stuff follows – we all know running a label and signing music to other labels isn’t a money maker – we do it for the love. If you were to change one thing in the music industry what would that be? Al – Some people’s ridiculous arrogance, when they’ve had one slightly successful thing & then they believe they have re-invented the wheel. It’s one behavior I really can’t stand! Any important goals you want to achieve with your music? Al – For me, getting something of mine onto vinyl was a goal, which is going to happen now in 2015 at last! Also getting 3am back onto vinyl too, after a ten-year hiatus. Carlo – I’ve never had any proper releases on vinyl – only something I got pressed up years ago myself. I’d love to get on a few large labels on vinyl and then get the chance to hang them in the studio all framed. I’m pretty happy the way things are going at the moment and I’ve achieved quite a lot over the last 5 years of really producing properly. Any other hobbies than music? Last question guys… Anything we don’t know about Al and Carlo that you haven’t told us about? Carlo – Have you seen the Godfather……..I’ll leave it at that (yes Carlo Gambino is my real name).